Professor Rabbi Saul Lieberman, Talmudic scholar and researcher and for many years Rector of the Jewish Theological Seminary of America, devoted much of his study to the systematic elucidation of the Tosefta. He undertook the publication of the Tosefta text, based on manuscripts and accompanied by brief explanatory notes, and of an extensive commentary called Tosefta ki-Fshutah. 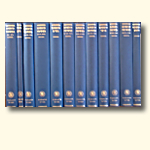 The latter combined philological research and historical observations with a discussion of the entire Talmudic and Rabbinic literature in which the relevant Tosefta text is either commented upon or quoted. Prof. Lieberman’s scholarship demonstrates how he combines vast erudition in all fields of Talmudic and Rabbinic literature with a penetrating knowledge of the classical world. Prof. Lieberman opened new pathways to the life, institutions, beliefs and literary products of Jewish Palestine in the talmudic period.